Recently, the newer anticoagulants (blood thinners) Pradaxa and Xarelto have made news because many folks have filed lawsuits and blame the drugs in causing uncontrollable internal bleeding and hemorrhage. Latest blood thinner to hit the market, Eliquis, is also known to carry a high risk of internal bleeding which could prove fatal to patients. The Dr. Shezad Malik Law Firm is currently accepting Eliquis bleeding and hemorrhage injury cases nationwide, including California, Florida, Illinois, New York and Texas. If you or somebody you know has been diagnosed with severe bleeding, you should contact our lawyers immediately for a free case consultation. Please use our contact form to connect with our dangerous drug attorneys or call toll free 24 hours a day at 888-210-9693 ext. 2 or 214-390-3189. Eliquis was introduced in 2012 by Pfizer and Bristol-Meyers Squibb to prevent stroke in patients with atrial fibrillation (common heart rhythm problem) and to prevent blood clots in patients undergoing hip or knee replacement surgery. Xarelto (rivaroxoaban) was the second member of this new group of blood thinners introduced in 2011, and has become the best selling new anticoagulant drug. These “Factor Xa” anticoagulants, have been aggressively marketed as superior alternatives to warfarin. 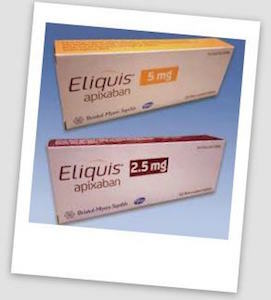 Pradaxa (dabigatran) was introduced in late 2010 and Eliquis (apixaban) was introduced in 2012. Coumadin (warfarin) is widely available as a generic and significantly less expensive than the new blood thinners. The manufacturers have pushed doctors to change patients over to the newer drugs, by recommending that Xarelto, Pradaxa, and Eliquis are safer and easier to use, without the need for blood monitoring during treatment. Recent studies, suggest that blood monitoring on these drugs may actually reduce the risk of severe bleeding problems. As the market share of Eliquis has increased, concerns have been raised about the bleeding risk. Many patients and doctors have reported incidents of uncontrollable hemorrhaging or bleeds, that may result in severe injury or death. While all blood thinners carry a risk of bleeding problems, doctors can quickly stop the blood thinning effects of warfarin. But, there is no Eliquis antidote, leaving doctors unable to stop bleeding problems that may occur during use, which may increase the risk of more severe injury or death. Pradaxa, Xarelto and now Eliquis have been aggressively marketed and promoted as superior alternatives to warfarin (Coumadin), which requires regular blood monitoring. These new blood thinners are also ranked among the most dangerous medications to take based on the number of adverse events reported to the FDA. This lack of bleeding antidote has led to thousands of product liability lawsuits against Pradaxa, alleging the company manufactured and sold a dangerous drug and failed to warn users or the doctors that a reversal agent does not exist. Bayer and Johnson & Johnson, the makers of Xarelto, are exposed to litigation over claims they failed to warn users about the bleeding risks of their drug. In December 2014, the U.S. Judicial Panel on Multidistrict litigations centralized nearly 50 federal Xarelto lawsuits in the Eastern District of Louisiana. Mass tort proceedings have been also been set up in Philadelphia for all state court cases brought in Pennsylvania over side effects of Xarelto. At least 75 complaints have been filed against Bayer Healthcare and Johnson & Johnson’s Janssen Pharmaceuticals subsidiary in Pennsylvania state court. Many more Xarelto lawsuits are expected to be filed in the 2015. Do I Have a Eliquis Lawsuit? The Dr. Shezad Malik Law Firm is currently accepting Eliquis bleeding injury cases nationwide, including California, Florida, Illinois, New York and Texas.